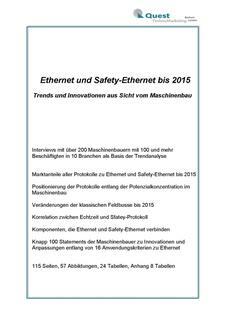 The new Quest study covers the current changes of the machine-builders in regard to Ethernet and field buses at the machines, the control technology, the drive technology, IO-Link and RFID, in what respect changes of the control system and the drive technology are joined with changes of suppliers and with a view beyond 2012: how the machine-builders are evaluating a comprehensive integration of the machines’ automation. Now the machine-builders can compare their changes with those of their sector. The manufacturers of automation technology can adjust to these changes in time and purposefully. This year the change readiness of the machine-builders shows a differentiated picture. 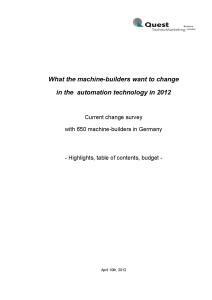 51% of the machine-builders want to change automation technology at the machines. This value indicates a bottom as the change readiness ranged from 2007 to 2011 between 56% (2007) and 82% (2011). On the other hand the change readiness in regard to the control technology lies with 25% relatively high. The new Quest study differentiates in detail the changes of the machine-builders regarding the classical field buses, the real time Ethernet protocols and Safety Ethernet. The number of change-willing machine-builders is always combined with the associated machinery potential. Ethernet-based field buses are being further implemented at the expense of non-Ethernet field buses. Also Safety Ethernet finds carefully more users. Regarding the control technology the technology change is slightly intensifying this year compared to last year. Three control technologies, i.e. the PC technology, the integrated control platform and the PLC, are benefiting from. For years the PLC is again achieving an active role in the technological change. Three changes in the drive technology are stably showing up, the most important one is the substitution of the classical by the integrated safety engineering at drives. The readiness to change the supplier in connection with technological changes shows tendencies moving in opposite directions. While this change readiness is noticeably increasing in the drive technology it’s on the other hand lowering in the control technology. The current topic, how the machine-builders evaluate a comprehensive integration of machines’ automation, covers a quarter of the study. The comprehensive integration of machines’ automation is divided into eight integrated partial solutions. The evaluations of the machine-builders are combined with the related machinery potential. So this part of the Quest study provides a roadmap for the ambitious manufacturer of automation technology to which extent an integrated total solution and to which extent integrated partial solutions will be preferred by the machine-builders in the future. A part of the changes in the control system and drive technology is published in the Quest Trend Magazine Online on www.quest-trendmagazine.com. The new Quest study „What the machine-builders want to change in the automation technology in 2012” is representative since it covers 37% of the machine-building industry companies in 10 section industries with 100 and more employees. It was accomplished in February/March 2012 and covers 78 pages. Highlights, table of contents and budget of the new Quest study are ready for the download on www.quest-technomarketing.com. Quest TechnoMarketing, Bochum, London, is specialized in market surveys and marketing for the automation technology for more than 20 years and the publisher of the Quest Trend Magazine in English and German language.